Old map by VON REILLY - Karte von dem Russischen Reiche in Europa . . . Title: Karte von dem Russischen Reiche in Europa . . . Size: 22.0 x 29.5 inches. Condition: In very good condition, printed on heavy paper. Franz Johann Josef von Reilly (Vienna 18 august 1766 - 6 july1820) was active as geographer, journalist, book and art dealer. 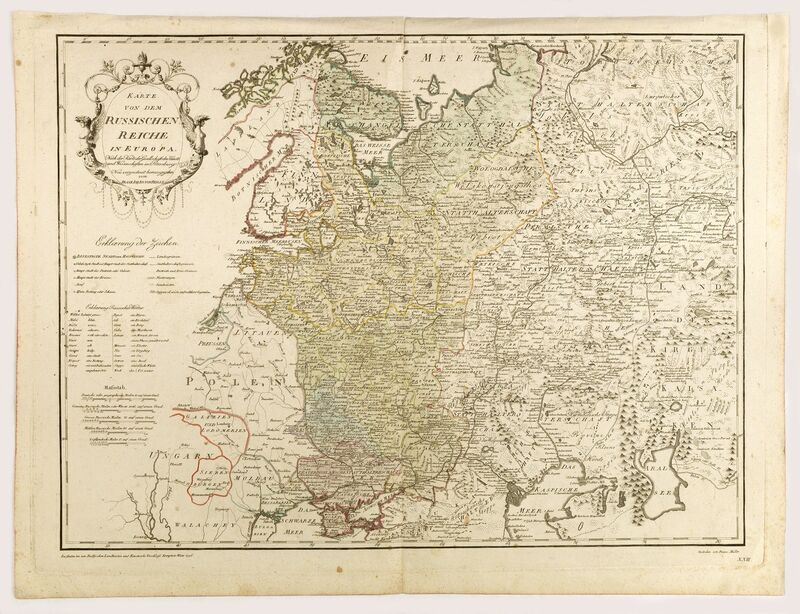 In 1792 he created his geographical Komptoir and was extremely prolific, producing no less than 830 maps. In 1796 he published his large Deutscher Atlas which was the first world atlas produced by an Austrian. His Allgemeiner Post atlas (1799) was the first post route atlas at all. As a writer von Reilly became particularly famous by his Sinngedichte and his poetic work Noradin (1813), which falsely is often attributed to J. J. Polt. Reference: Phillips 2845; Dörflinger, Atlantes Austriaci I, 83 ff..